See how fast you can go on Rails, and how reliable it's become with the stability and power of version 2.1. 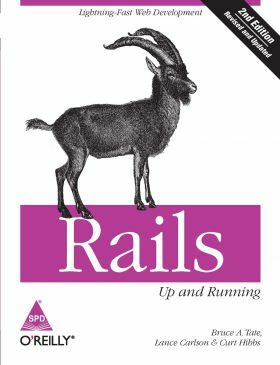 With Rails: Up and Running, you'll discover why Rails is a remarkable new way to build database-driven web applications. About the Authors Bruce A. Tate is a kayaker, mountain biker, and father of two. In his spare time, he is an independent consultant in Austin, Texas. In 2001, he founded J2Life, LLC, a consulting firm that specializes in Java persistence frameworks and lightweight development methods. His customers have included FedEx, Great West Life, TheServerSide, and BEA. He speaks at conferences and Java user's groups around the nation. Before striking out on his own, Bruce spent 13 years at IBM working on database technologies, object-oriented infrastructure, and Java. He was recruited away from IBM to help start the client services practice in an Austin startup called Pervado Systems. He later served a brief stint as CTO of IronGrid, which built nimble Java performance tools. Bruce is the author of four books, including the bestselling "Bitter Java", and the recently released Better, Faster, Lighter Java, from O'Reilly. First rule of kayak: When in doubt, paddle like Hell. Lance Carlson has been programming Ruby since Rails version 0.13 was released, and he has been riding on its coattails since. He currently owns Ruby Skills, a Ruby consultancy firm and is working for Engine Yard as an application support engineer. Lance has contributed to various Ruby open source projects such as Merb, Rails, DataMapper, and he is also the creator of Ruby Anvil. Curt Hibbs has always been slightly obsessed with new technologies and tracking technology trends. But he will tell you that this is simply because he is lazy, always looking for new methods and technologies to make his work easier and more productive. This led to his discovery of Ruby in 2001 (when it was still relatively unknown outside of Japan) and to his founding several highly successful Ruby open source projects. For most of his professional career, which started in the early 1970's, Curt has been a consultant to well-known companies like Hewlett Packard, Intuit, Corel, WordStar, Charles Schwab, Vivendi Universal, and more. He has also been a principal in several startups. Curt now works as a Senior Software Engineer for The Boeing Company in St. Louis.